Prior to his emergence into the spotlight, Runtown, born Douglas Jack Agu, worked jointly with respected Nigerian artists such as Port Harcourt born-star Enitimi Alfred Odom, popularly known as Timaya and Oyoyo crooner J-Martins. He, however, had his career breakthrough after he co-founded an Ikoyi-based record label called Penthauz, together with Enugu State-born rapper/singer/record producer Chibuzor Nelson Azubike, popularly known as Phyno. Through the label, which was founded in 2008, Runtown released his first hit singles titled: Activity Pikin and Pary Like It’s 1980. Runtown was further thrust into an immense popularity in 2015 when he featured Skelewu crooner Davido, born David Adedeji Adeleke, in his song, Gallardo. Shortly after the epoch-making collabo, precisely on June 21, 2016, Runtown was signed by Prince Okwudili Umenyiora’s record label, Eric-Manny Entertainment. He, however, severed his multi-million Naira contract with the label in July 2018. While Eric-Manny Entertainment alleged that it decided to end its affiliation with the artist for signing up and attending musical concerts without its knowledge, the Mad Over You hitmaker claimed that he left the label as a result of extortion, a violation in their deal, and a threat to life. Over the course of his fast-growing music career, Douglas has banded together iconic Nigerian artists like M.I, WizzyPro, Skales, Phyno, Wizkid, Timaya, Atlanta-born star Davido, and many others. According to him, his major musical influences are Sean Kingston, Bob Marley, and Kanye West. Who Is Runtown, Where Is He From? Runtown is one of Nigeria’s fast-rising artists who has been in the spotlight since 2010. He was named Douglas Jack Agu at birth, as mentioned earlier. The multi-hyphenated star was welcomed into the world on the 19th day of August 1989 in Enugu State, a state in southeastern Nigeria. Runtown spent his childhood in Abuja and Lagos. He was born to a mother who was formerly a federal civil servant and later became a politician. His father died while he was still very young, leading to his relocation from Lagos to Abuja to stay with his mother. His family later moved to Enugu in 2005 in order to allow his mother to pursue her political ambition. He later completed his secondary school education in Enugu, having completed his primary school education in Lagos. According to information online, the Gallardo singer is currently pursuing a career in Fashion Management at an undisclosed institution of learning in New York City. Runtown is yet to officially tie the knot with his sweetheart, Selena Leath, whom he met in 2015 in the United States while shooting a music video titled: Bend Down Pause. The pair’s relationship has produced a son called Zamar, who was born in June 2017 in Los Angeles, in the United States. 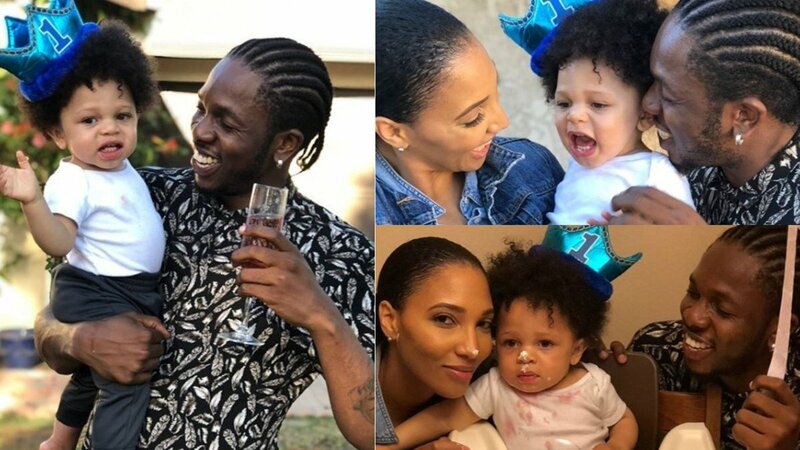 As gathered, Runtown’s baby mama is a US-based actress/model. A video vixen, she is reported to have also appeared on cameos with prominent rap artists like 2Pistols, Nas, Dutch-Pakistani ImranKhan, French Montana, Slaughterhouse, and CeeLo Greene. Leath was born in August 1987. 1. Runtown’s childhood dream was to become a professional basketball player. 2. In his budding years, he was mentored by popular singer Martins Okechukwu Joshua Kalu Okwun, best known as J-Martins, who also featured him and Phyno in his album, Tonight. 3. The singer/record producer became friends with Timaya after J-Martins introduced him to the Plantain Boy singer. 4. Before he switched over to Penthauz record label, he was previously signed to Sputnet Records. 5. The Enugu State-born singer made the decision to pursue a career in music in 2007. He, however, kicked off his professional career three years later. 6. Runtown’s Gallardo earned him the Best Collaboration of the Year award at the 2014 Nigeria Entertainment Awards. 7. In 2015, he was nominated for the Artiste of the Year at the 2015 City People Entertainment Award as well as the Best Pop Artiste in the Nigeria Entertainment Awards. 8. In 2014, it was rumored that Runtown wrote Davido’s hit single Aye but the singer is yet to either confirm or deny the claim. He keeps telling people to meet Davido to know more about the writer of the song. 9. His family’s decision to move to Lagos was made after his father was admitted at the Lagos Teaching University Hospital (LUTH). They later relocated to Abuja after his death before they eventually moved to Enugu State.